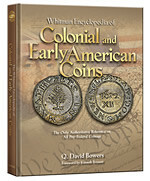 Recently Wayne Homren, Editor of the fantastic and highly recommended E-sylum (which, in their own words, is described as "a weekly electronic newsletter published by the Numismatic Bibliomania Society for numismatic bibliophiles, researchers, and just plain numismatists around the world"), wrote a review of the new Whitman Encyclopedia of Colonial and Early American Coins. WWCD - What Would Crosby Do? If Sylvester S. Crosby, author of the 1875 classic Early Coins of America were alive and writing his book today, what would he do? Would he produce a book similar to the Whitman Encyclopedia by Q. David Bowers? Today's imaging and publishing technologies are far in advance of methods available in 1875, and I'm sure Crosby would approve of the color photos throughout out the book. Bowers and Crosby both illustrated and discussed major varieties as well as the history behind each major coin type. Would Crosby include prices? His 1875 book didn't, but in his day the coin market was very different, with far fewer transactions and less emphasis on valuation. Crosby's thorough research and writing made it the standard work for over a century. But if it had included prices it would have been obsolete in a couple of years. I see both pros and cons to including prices. Valuation is a key feature many people look for in coin reference books - I'm sure many more copies of the book will be sold than would have if it hadn't included pricing. In a few (years/months/days) the prices will be obsolete and there will likely be demand for Whitman to publish a new edition, another reason to sell more books. I'm generally in favor of the inclusion of prices; to me, more information is better, even if it has a short shelf life. And pricing information is useful as a relative guide even when individual prices are the subject of debate. And debate there is - the colonial coin mailing lists and discussion boards lit up when the book came out, with many people criticizing individual prices. One commenter decried the $500 price assigned to what he deemed a $50 coin. Others pointed out prices they thought were too low. In a field such as early American coinage, where mintages are generally low, the coins are rarely uniform in manufacture, and the collector base is relatively small in comparison to regular issue coinage, is it inevitable that pricing disagreements will ensue. In the case of very rare pieces, Bowers takes a "just the facts" approach, listing individual recent auction prices for the piece. These citations are a useful compilation of information which can lead the reader to sources of additional information. As for the prices provided by valuations editor Larry Stack, collectors will inevitably debate them; I'm sure every new edition of Whitman's yearly classic Red Book has its pricing detractors. Would Crosby include more historical information about the coins? He did in his 1875 book, but because Crosby and many other writers have also done so, author Bowers doesn't really have to. It would make a big book much bigger without adding a lot of value; the Whitman Encyclopedia is a useful publication for what it is - a handy one-volume compilation of key information about an often bewildering and multifaceted field. The Breen Encyclopedia and Crosby books are too meaty (and hefty) to carry around coin shows; I think we'll see a new breed of collectors roaming the aisles of coin shows armed with the Whitman book while they shop for colonial coins. Although long-awaited, the Whitman Encyclopedia doesn't make any of these earlier books obsolete. Bowers states plainly in his introduction that Remarkably, one of the best "reads" of all remains the 1875 work by Crosby, The Early Coins of America. To this I would add the privately-published In Yankee Doodle's Pocket, the 2008 work by Will Nipper reviewed earlier in The E-Sylum. Here's a suggestion for Whitman - why not buy the rights to Nipper's book and offer it in a boxed set with the Whitman Encyclopedia? The company's marketing clout could bring Nipper's book to a wider audience. The two titles are very complimentary and will soon be standing side-by-side on my colonial shelf. For that matter, why not reprint Crosby's The Early Coins of America and make it a three-book boxed set? Sure, I realize it's easy to make suggestions for someone else's business plan. But no matter - collectors can and should acquire all three works for their libraries, regardless of who publishes them. I'll leave it to the colonial coin specialists to review the nitty-gritty of the book; several of them have already pointed out various mistakes such as the occasional mislabeled or juxtaposed photos. As a bibliophile my biggest concerns are with the book's paper and images. The glossy paper is nonetheless thin and prone to easy creasing. Thankfully the book is hardcovered, which helps prevent other kinds of damage. The photos, which by necessity are small, also seem to be oddly uniform in color. I've praised Whitman publication photos in other books, but I'm not as impressed with these. One thing the bibliophile in me appreciates in the inclusion of engravings to open each section; several are taken from an obscure but important early resource - O'Callaghan's 1850 Documentary History of the State of New York. My favorite part of the book is Dave's Introduction, which is a great first-person account of his interest in the topic of colonial coinage and interactions with all the top collectors and researchers of the last half century. I think E-Sylum readers will appreciate it as well. I also greatly appreciate Chapter 12, 19th-Century Colonial Copies and Fantasies, which to me is alone reason enough to justify the purchase price of the book. Sections cover the Thomas Wyatt copies of the 1850s, the John Bolen, Alfred Robinson, Montroville Dickeson, and William Idler copies of the 1860s, C. Wyllys Betts' fantasy coins of the 1870s, and other important copies such as the 1860s "New Haven Restrikes" of the Fugio Cent. All in all, the long wait was worth it - Dave Bowers' latest book is another feather in his cap.